a device for studying or monitoring the atomic structure of a specimen by recording on photographic film the pattern obtained when X rays are diffracted by the specimen. X-ray cameras are used in X-ray diffraction analysis. The function of the camera is to ensure that the conditions for X-ray diffraction are satisfied (see bragg-vult condition) and to produce X-ray photographs. An X-ray tube is used as the radiation source for an X-ray camera. X-ray cameras differ in design according to the purpose of the camera; X-ray cameras of different types are used, for example, to investigate single crystals, to study polycrystal-line powders, to produce small-angle X-ray photographs, and to obtain X-ray topograms. All types of X-ray cameras contain a collimator, a specimen-mounting unit, a cassette containing photographic film, and a mechanism for moving the specimen and, sometimes, the cassette. 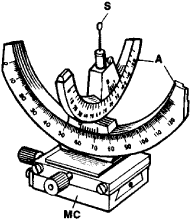 The collimator forms the working beam of primary radiation and consists of a system of slits, or apertures, that, together with the focus of the X-ray tube, define the beam direction and its divergence—that is, they determine what is called the geometry of the method. Instead of a collimator, a flat or curved crystal monochromator can be mounted at the entrance to the camera. The monochromator selects X-radiation of certain wavelengths in the primary beam; a similar effect can be achieved by using selectively absorbing filters in the camera. Figure 2. Schematics of X-ray cameras for investigating powder samples: (A) Debye camera, (b) focusing camera with a curved crystal monochromator for studying specimens by transmission (the region of small diffraction angles), (c) focusing camera for back-reflection photography (large diffraction angles) on a flat cassette- (S) specimen, (F) focus of X-ray tube, (M) crystal monochromator, (C) cassette containing photographic film PF, (T) trap intercepting the unused X-ray beam, (FC) focusing circle (the circle along which the diffraction maxima’lie) (CL) collimator, (MC) mechanism for centering the specimen. The arrows indicate the directions of the direct and diffracted beams. synchronism with the movement of the film while preserving the angular position of the specimen. The cassette of an X-ray camera is used to impart the necessary shape to the photographic film and to provide light protection. The most widely used cassettes are flat or cylindrical. The cylindrical types are usually coaxial with the axis of rotation of the specimen; in the case of focusing methods, the specimen is placed on the surface of the cylinder. In other X-ray cameras—for example, in X-ray goniometers and in X-ray cameras for X-ray topography—the cassette is moved or rotated synchronously with the motion of the specimen. In X-ray cameras of the integrating type the cassette is also shifted by a small amount during each X-ray photographic cycle. As a result, the diffraction maximum on the photographic film is spread out, the recorded radiation intensity is averaged, and the accuracy of measurement of the intensity is improved. The specimen and cassette are moved for different purposes. When powder samples are rotated, the number of crystallites reaching a reflecting position is increased, and the resulting diffraction line on the X-ray photograph is uniformly blackened. The movement of a single crystal permits different crystallo-graphic planes to be placed in a reflecting position. In topographical methods, the range of investigation of the specimen is expanded when the specimen is moved. In X-ray cameras where the cassette moves synchronously with the specimen, the mechanism that advances the cassette is connected to the mechanism that moves the specimen. The X-ray camera permits the structure of a substance to be studied in various situations, for example, under normal conditions, at high or low temperatures, in a high vacuum, in an atmosphere of special composition, or under mechanical stresses and strains. The specimen holder can include devices for producing the necessary temperatures, vacuum, or pressure; it can also have measuring instruments and means for protecting the camera assembly against undesired effects. X-ray cameras used for investigating powder samples are substantially different from those for single crystals. Powders can be studied with a parallel primary beam, as in Debye X-ray cameras (Figure 2,a) (see also debye-scherrer method), or a divergent beam, as in focusing X-ray cameras (Figure 2,b and 2,c). Focusing X-ray cameras permit rapid measurements, but the X-ray photographs they produce record only a limited range of diffraction angles. A radioactive isotope source can be used as the source of primary radiation in such cameras. X-ray cameras for investigating single crystals differ in design according to their function. For example, one type of camera is used to orient a crystal, that is, to determine the direction of its crystallographic axes (Figure 3,a on page 696) (see also laue pattern). Rotating and oscillating cameras are used for measuring lattice parameters (from a measurement of the diffraction angle of individual reflections or from the position of layer lines) and for determining the type of unit cell (Figure 3,b and 3,c). X-ray cameras for the separate recording of diffraction maxima—that is, the scanning of layer lines—are called photorecording X-ray goniometers. Topographic X-ray cameras are used to investigate imperfections in the lattices of near-perfect crystals. X-ray cameras for single crystals are often equipped with a reflecting goniometer system for the conducting of measurements and the initial mounting of very small crystals. X-ray cameras that record scattering at small diffraction angles (of the order of a few seconds of arc) near the primary beam are used to investigate amorphous substances, vitreous substances, and solutions. The collimators of such cameras must keep the primary beam from diverging in order that the radiation scattered at small angles by the object in question can be isolated. Various techniques can be employed toward this end; for example, a vacuum can be created, or use can be made of beam convergence or extended ideal crystallographic planes. X-ray cameras for studying objects of the order of a micrometer in size are used with fine-focus X-ray tubes; in this case the distance between the specimen and the photographic film can be greatly reduced, as in microcameras. X-ray cameras are often named after the inventor of the X-ray photographic technique used. Umanskii, M. M. Apparatura rentgenostrukturnykh issledovanii. Moscow, 1960. Finkel’, V. A. Vysokotemperaturnaia rentgenografiia metallov. Moscow, 1968. Finkel’, V. A. Nizkotemperaturnaia rentgenografiia metallov. Moscow, 1971. X-ray camera - c-arm with digital detector, Parameters in accordance with attachment 5 to siwz - list of parameters required, 1. The X-ray camera on Swift, built by a team from University of Leicester, helped the astronomers discover one of the most&nbsp;luminous white dwarf eruptions ever seen by humans. ySTANBUL (CyHAN)- NASA's first wide-field soft X-ray camera, which incorporated a never-before-flown focusing technology when it debuted in late 2012, is a gift that keeps giving. Currently, most patients presenting with angina end up having an angiogram, in which thin plastic tubes are passed from an artery in the wrist to the heart so that dye can be injected down the coronary arteries under an X-ray camera. Further developments need to be done, for example, to characterize the different materials that are identified by the X-ray camera. Once these technologies were developed for XMM-Newton's X-ray camera, the developers realised that the knowhow could be used in a variety of applications on Earth. An X-ray camera is used to guide doctors in positioning the catheter in the heart artery where the stent was placed. For example, digital X-ray camera SCAN300TDI, made by company AJAT Oy , placed across the conveyor apron, may collect image lines with resolution 0. Experts from Aberystwyth University have contributed a sophisticated X-ray camera - due to play an integral part of the maiden voyage. Accordingly, the Dubai Mercantile Exchange announced that it would deploy a new x-ray camera that "can see through clothing to detect hidden explosives, drugs and weapons. What's the world coming too? : A camera that sees through clothing! This is true also of cardiac catheterization, angioplasty and stenting, all of which involve taking pictures of the heart with an X-ray camera. Sanjay Nand taught his fellow dental assistants how to run the digital X-ray camera and accompanying computers that the unit received last year.